Discussion in 'Work in Progress' started by Walky, Jan 19, 2019. I'm working on Backpack Twins, a platformer with puzzle elements for PC, based on a character switching mechanic. Another key gameplay element is the ability to step on the other character's backpack to reach higher places. Coming soon! Any comments, questions and suggestions will be greatly appreciated! Yrbiax, sitebender, Amon and 1 other person like this. Added a playable demo in the first post. To activate a checkpoint, both twins must contact it at the same time. This ensures that you've already beaten a section. Making progress on the tutorial, which also introduces the main characters and premise. Also added a new screenshot to the main post. Looking for feedback! It would be really appreciated. Will try to find time to try it out this week-end! Hey, i tried your demo. I really liked the music. Thanks for trying the demo! Interestingly enough this is not the first time I get this kind of comment regarding that particular section. Yesterday I happened to try it while listening to music (not the game's music) and it turns out the tempo really throws me off! It suddenly became much more difficult without being able to follow the spikes' sound cues (I usually beat in on the first try, but I've played this level like a hundred times so it's not a fair metric by any means). By the way, this is by no means an early level, just the only one I had completed. Early levels will be easier (you can't even die in the first level), and will get harder as additional gameplay elements are introduced. I figured it was only fair to try out your game after all the feedback you gave on mine. 1. Like Yrbiax, I quit at that point, I'm not one for very difficult games, and it took me a good 20 retries to get to that point in the game, I'm sure most people are better at this kind of thing than me, but I definitely agree it probably suits a level close to 2/3 or 3/4 through the game. 2. Like Taddio said, I think this would make a really good 2 player experience. I can see from the level design though, that it might be more designed to go with 1 player moving at a time, and then the other one. Rather than letting 2 players move at once. I'm just a big fan of multiplayer, so I try and put it everywhere haha. 3. Perhaps let the player be controlled by analog as well as the d-pad? I generally prefer to use analog over D-pad, even in some 2D platformers. 4. If you aren't planning to use it for anything else, you could map RT to switching characters too, at the moment you have to switch your fingers between A and Y for jumping and switching, but if it was mapped to RT, you could hold your fingers in the same position at all times and it might make for smoother gameplay if you have a section where switching quickly is necessary. I liked the music and style of the game up until the point where I quit, would have quite happily carried on, especially if the traps/obstacles become more diverse, other than spikes. I think I'l probably need to rearrange a lot of game sections based on feedback once all levels are complete. Being so familiar with the controls and mechanics makes it really difficult to figure out which ones are the hardest. I expect my next demo to have around 4 levels ranging from absurdly easy (tutorial) to insanely hard, so people can actually get to enjoy the game and see what it has to offer. I'm also considering a Nightmare/NewGame+ mode where all levels have modifications that make for a new challenge after beating the main game. It'd be nice to add this in the future, but I'd probably only consider this if the game does really well, since it would need a lot of work both in code and level design (pretty much new levels for coop). Yes, I have plans for this to be implemented in the future, thanks. Controls are not final, and are currently like this because the game originally was very different from the current one, and included weapon shooting and switching (10 weapons), and even a teleport and shield mechanic. Then I decided to start cutting things away, start small and only consider new elements if they make sense. I really want to add the teleport mechanics (it's was specifically designed with puzzles in mind) later in development, but it would be probably introduced in later levels since it would break a lot of earlier puzzles. The game even has slopes but I don't feel they will be used too much. Right now there's also a hidden surface containing a health and stamina bar, weapons overlay and even a character portrait, all of which will be removed from code later and are now clumsily commented; actually, I think you can still get it to show at this point if you switch between windowed and fullscreen a few times. I considered this but decided against it because I feel that puzzles that need really precise button sequences such as a fast Action -> Switch -> Jump combo would work better when switching only among the front buttons instead or alternating between the thumb and index finger (e.g. like doing a fighting game combo with only the front buttons versus mixing the combo with shoulder buttons). I'm considering changing it from Y to X, but I'll put that decision on hold since I'm still not sure if I'll implement any type of shooting mechanics (which may or may not use the X button, anyway). Controller customization is in my plans, though. I like the idea of full button customization instead of presets, so that it's more accessible (so it can be played even with one hand, for example). Today I implemented floor switches and doors. They are an effective way to force different paths for each character without taking control away from the player, and also allow for new puzzle possibilities. I've just added a GIF at the end of my first post showing how they work. Added a couple of new GIFs. Having a lot of fun designing and testing new puzzles! Just watching them is making me cry at how many times I'm not going to succeed. I'll leave this in this post since the sequence would easily get lost in the original one. "Oh! A door and a switch! This is so easy." "Ha! you won't get me twice!" "You thought I wouldn't figure it out?" "What am I fighting fooooooooooooooor!?" mamacato and sitebender like this. mamacato, sitebender and O.Stogden like this. I want to see levels I would be capable of finishing. Nevertheless, looking good for those more puzzle-y minded. mamacato and Walky like this. You're going to love this one! - 7 levels designed so far. Each level contains multiple puzzles to solve, along with a few platforming-only sections. - Added collectibles!. Similar to VVVVVV's trinkets, you must reach a checkpoint to reclaim them (otherwise if you die you'll have to get it again). In many cases this means getting the collectible mid-way through a puzzle, resulting in optional increased difficulty (especially in time-sensitive ones). Get them all to unlock something very nice! - Progress can now be saved (currently only for collectibles, will add the rest later). - Added a Super Mario World style overworld. - The overworld shows the obtained and total collectibles for each level. - Levels can be revisited to obtain missing collectibles. - Added a fading effect when dying, and also when going to a level or the overworld. - A few new graphic assets such as mist, a new background and a few tileset variants. - Made a few changes to the fluids code to allow for a different sprite on the surface than the "depths" sprite. Looks much better now. - A number of minor changes and bug fixes. - Now there can be checkpoints that require one player and others that require both of them. This allows path splitting in a more flexible way. - All previous checkpoints will now disappear after a more recent one has been reached, even if they were skipped. This is very important since it prevent players from trying to confirm a collectable with a previously skipped checkpoint instead of beating the collectable's own section/puzzle, which is a must. 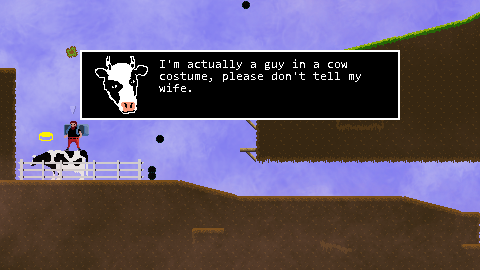 By the look of it, I think I may be able to get a new playable demo out in a few days or weeks. My question is, what's actually inside the backpacks? mamacato, Walky and SnotWaffle Studios like this. Those are body-sized backpacks, so I'd better not ask! Anyway, maybe they have backpacks simply because otherwise they wouldn't be Backpack Twins! The game now keeps track of level completion times. 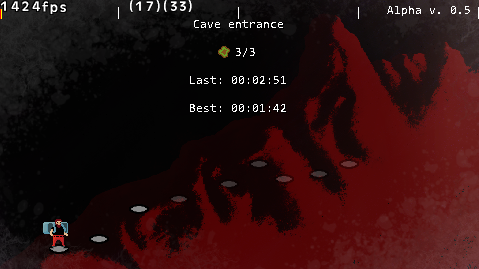 Soon it will also keep track of total time and number of deaths, and if you play this game you will die a lot! There's also a "par" time integrated in code, but I'm not sure if I'll be using it. Also, development time has been reflected in the twins' facial hair. Don't make me speedrun it, please, I beg you. looks good. I'll give it a try. Please tell me what software did you use to create those gifs? I should call it "Death Trap Twins... with Backpacks!" Thanks! I use GifCam (I suggest setting it to 30 fps, any higher and the GIF speed will be wrong). Found a good (I hope) way to make it clear to the player that both twins are needed at the end of the level. mamacato, PlayerOne, CMAllen and 1 other person like this. That is a very clever and simple method. I like it. Will greatly appreciate retweets and comments! Please follow if you like what you see, I'll be tweeting updates regularly. Added a proper, embedded trailer to the first post, check it out! Ever heard of using VR to make assets for a 2d game? Well, now you have. How did you use VR for that? I used Oculus Medium, took a picture and then edited it to remove the background and scaled it to my game's resolution. Ah ok, not really familiar with VR, so was wondering how that helped make anything haha. woodsmoke and Siolfor the Jackal like this. All levels but one are done!. Still some features missing, but very close to beta! O.Stogden and Siolfor the Jackal like this. I made a discord server, feel free to join! Implemented multilanguage support and most of the main menu. As always, feedback is greatly appreciated! Yrbiax, O.Stogden, Siavellez and 1 other person like this. It has definitely improved since i last time played. Lava level gave me anxiety. I got to this point, but i just couldnt get timing right. @Yrbiax Thanks for trying the demo!